The Laundry, Distribution and Food Service Joint Board represent members in the private and public sector in NJ, CT, and NY. Our members are politically active and volunt arily make contributions to the Workers United for Political Power to ensure that we increase the standards for workers and enhance the quality of life for our communities. It’s important to ensure we live in a just society with policies that support immigrants that foster racial justice. Our Joint Board is rooted in winning for working people, therefore, we support candidates who invest in good jobs, believe in equality and are willing to fight to ensure working people are making a livable wage. Our members have exceeded their political contribution Goals two years in a row and have also canvass to ensure politicians are supporting our goals. 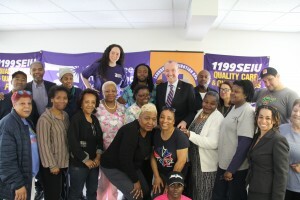 SEIU New Jersey State Council endorses Candidate Phil Murphy for Governor of NJ. ¡Hemos ganado la Lucha por $15! We Won the Fight for $15! Freeze Warehouse Workers go on a 2 hour strike!